Melissa and I are both obsessed with pumpkin for the Holidays (Halloween, Thanksgiving, and Christmas). We did not have much time to bake so we unfortunately could not make my favorite, pumpkin pie, but what we did make came close second. 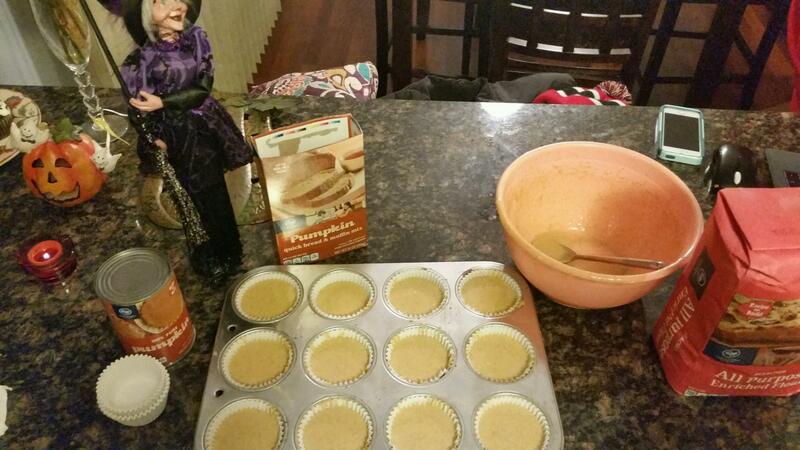 We made pumpkin muffins and pumpkin pancake muffins. 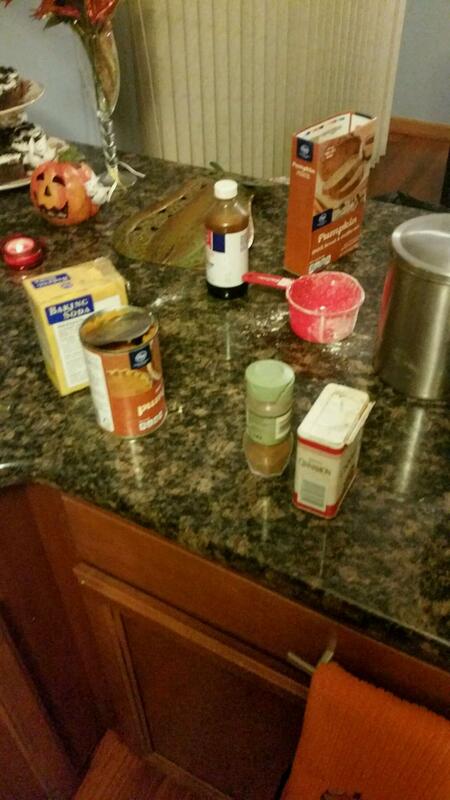 I went to Kroger and bought a box of bread mix, a can of pumpkin puree, cupcake paper, and flour and it cost me $5. So if you are looking for something easy, cheap, and tasty this is the way to go. *Don’t forget to preheat your oven to the temperature it calls for on the box. 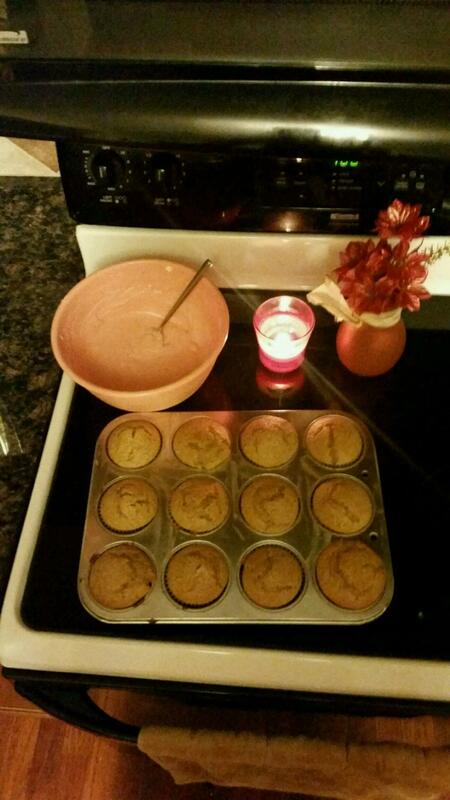 We first started with the easy recipe, the muffins. 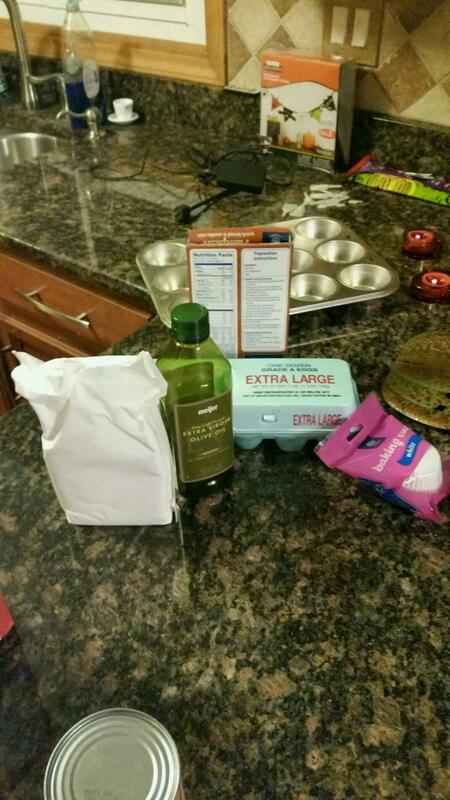 The box I got was for bread, but there was a recipe right below for muffins so we followed the directions on the box. After they were done baking we wanted to add a tasty frosting to give them something extra. We googled a simple recipe to make the frosting. I seem to find that homemade frosting doesn’t taste good, but this was surprisingly good and it wasn’t runny which I find to be a problem with some other recipes. Combine all ingredients in a bowl but do not over whisk. Just until all the ingredients are smoothly combined. After the muffins cooled we frosted them. 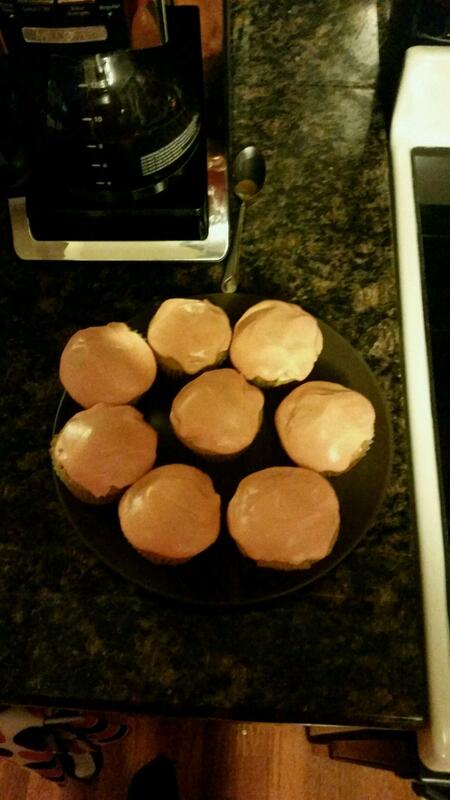 We added some food coloring to make the frosting orange for Halloween. 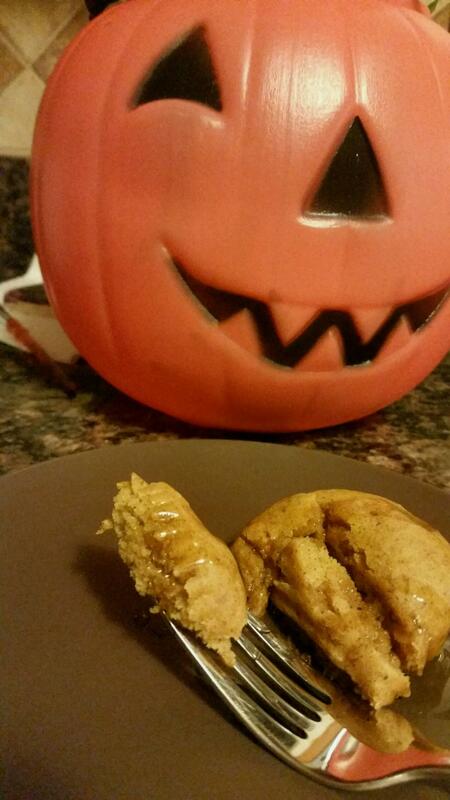 We wanted to make pumpkin pancakes but without the mess. Melissa says she usually makes pancake muffins. We looked up a pumpkin pancake recipe and then to find out for how long we bake them we looked up a recipe for pancake muffins. Sift flour, sugar, baking powder, cinnamon, and nutmeg together in a bowl. Melissa and I couldn’t find a sifter so we combines the ingredients in a bowl whisked them to break up the flour and make it fluffy. Whisk milk, pumpkin, egg, and oil together in a bowl. Pour milk mixture into flour mixture and stir until just moistened. The directions said the batter should be slightly lumpy, but our batter turned out very smooth. This is the step where we stopped following the pancake recipe and followed the pancake muffin recipe. We added the pancake mix to the muffins cups. Leave enough room for the mix to rise when it is baking. Bake for 18-20 minutes. When we initially tasted them we put syrup on them, but in the morning on the run they taste just as good without the syrup. These are perfect for a holiday breakfast, or any day. They are easy and definitely delicious. Enjoy! When we think of fall favorite recipes you normally think pumpkin pie, stuffing, cranberry sauce, turkey, green beans, cider mill donuts, apple cider, and one of my favorites apple pie. If you have ever made apple pie you know that finding the perfect recipe can sometimes be difficult. Well this year do not worry because we have found the perfect recipe for you AND it is Dutch apple pie, so it is even better than classic apple pie with the sugar crust on top baked until golden brown. Even with a graham cracker crust. 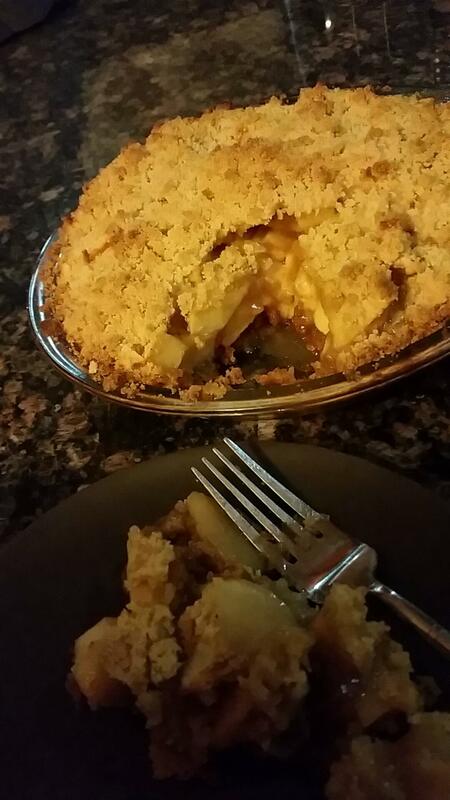 This isn’t the normal crust for an apple pie, but if you try it this way you wont regret it. First is the crust. 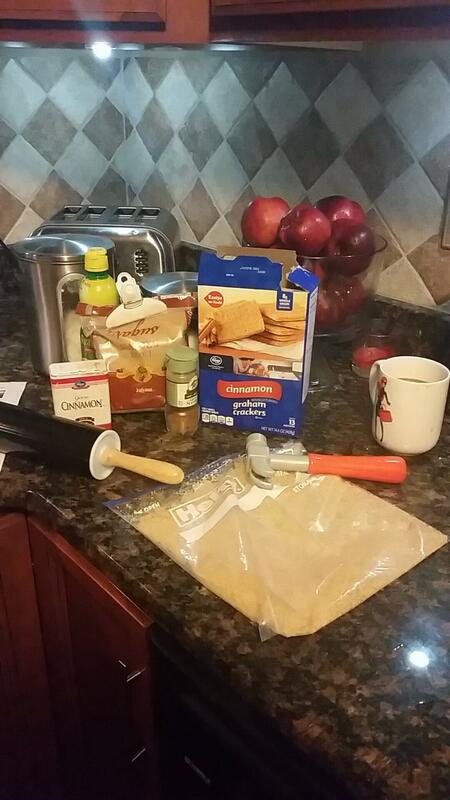 Take the graham crackers and crush them until you get 1 1/2 cups. Melissa put them in a plastic bag and used Aidan’s toy hammer to crush them, but if you don’t have a toy hammer I find a wooden or plastic cooking spoon does the job as well. When those are all crushed and you have enough put them in a bowl and add the melted butter, ground cinnamon, and granulated sugar. Mix them together and when they are all mixed together put them in the pie pan. Press the crust on the bottom and the sides. Set aside for later. Next is the apples. Cut, peel, and core 5 1/2 cups of cooking apples. Cut them into small to medium pieces. Put them in a mixing bowl and add the lemon juice, granulated sugar, brown sugar, flour, ground cinnamon, and ground nutmeg. Mix with a mixing spoon and leave them in the bowl until you mix the topping together. Last but not least is the topping. 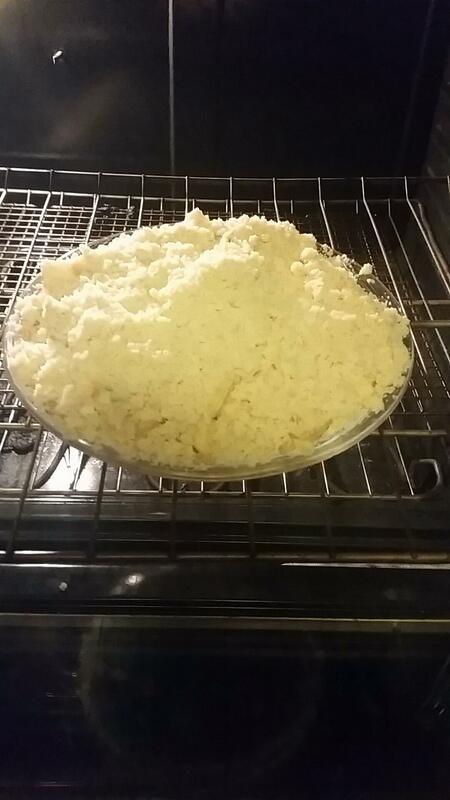 In a medium mixing bowl crumble the flour, sugar, brown sugar, and butter. Do not melt the butter or mix with a mixer. When the ingredients look like crumbs it is mixed well enough. 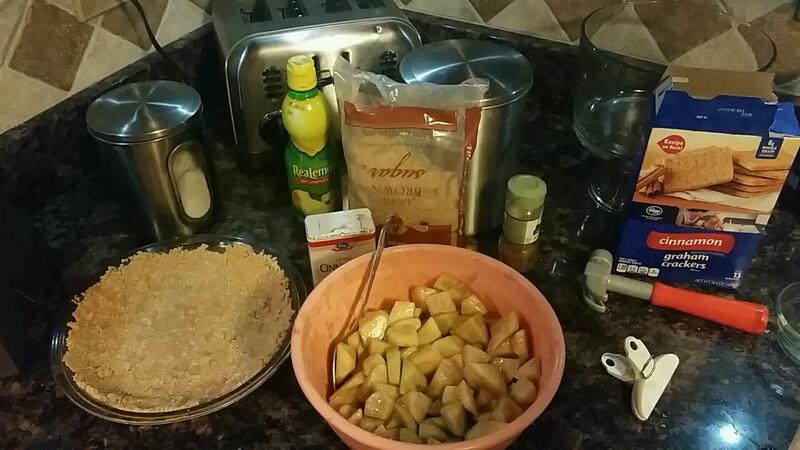 After you finish the topping you can put the apples into the pie crust and add the topping evenly. Bake for 50 minutes, the top should look golden brown. Let the pie cool and then cut. You can eat just the pie or add ice cream for an extra sweet taste. This is such an easy and delicious recipe that you can do it any time of the day and with the kids if you would like. Guaranteed to be a crowd please at any occasion, especially the holidays.